Purists argue that The Camino of Santiago from Triacastela to Sarria via San Xil is the original route. This Stage, despite being one of the shortest (18.3 km), has a degree of difficulty due to the great ascent that takes place in the first section, until reaching the peak of Riocabo. However, the pilgrim enters in union with nature passing through beautiful and peaceful indigenous forests and small villages lacking in commercial businesses. This does have its disadvantage, as attempting to purchase a bottle of water at certain times of year becomes a mission impossible. Upon reaching the LU-633, pilgrims cross the road and continue uphill a few meters to a narrow asphalt path following the signposts to San Xil. Before A Balsa there are a couple of junctions, well indicated. The Camino is comfortable and, on good terrain, it runs alongside the river until reaching the small hamlet of Triacastela. A Balsa is a tiny enclave that has rejuvenated over the years. A huge Republican flag welcomes pilgrims to one of the most picturesque villages on the Way. A laidback enclave of French influence. A Balsa has just opened its doors to the ecological hostel El Beso, run by Marijn Voogt and Jessica Moro. Its set-up was made possible thanks to donations of 25 euros made by friends, supporters and future guests, as well as many months of work, given that all the work was done by this young couple who met two years ago in Finisterre after a pilgrimage that changed their lives. Marijn left his computer job in the Netherlands to take up residence in A Balsa. All those who have contributed through donations, enjoy dinner, bed & breakfast for free. Arthur, an artist on the route A few meters ahead, a stone house at the foot of the pilgrimage route usually has its doors wide open to pilgrims offering a place to rest and pray. The Englishman Arthur undertook the Way in 2006 from Saint Jean Pied de Port. He chose the Samos variant, although he gave in to the charm of this area and decided to settle. With the help of a local mason, he reconstructed this old "ruin" to build "a house for Jesus", he says in a British accent. Arthur is a creative individual. Currently he is rewriting the Bible. His paintings (many of which hang on the walls) are famous among pilgrims. Surely he is lying when he claims that he only knows a chord. If his doors are closed, he is probably on a trip to the coast of Lugo. "To eat the rice with lobster, a typical dish in Rinlo" it makes my mouth water, "and surfing". At the exit from A Basta the most challenging stretch of this stage begins. The terrain heads uphill abruptly. The difficulty prevents the walker from fully enjoying the greenery of the area, where oaks dominate. The ground, of earth and stones, further complicates the ascent. Now on asphalt, the fountain, Fonte dos Lameiros offers a little respite to pilgrims. A few meters away there is a junction where the walkers should turn left to reach San Xil. This small town (around 25 habitants), was renovated in 2011, it does not offers any place to purchase supplies. On crossing a small stream there is a fork in the path without signs, but this is no major problem, since the two routes re-join a few meters ahead. Once leaving the centre, pilgrims have the possibility to enjoy the stunning panoramic view of the valley. After a difficult climb, yellow arrows painted on the road, a milestone and a small paved section indicate that the Camino deviates to the right, to coincide with the top of the Río Cabo, a place that represents a turning point in the stage. From here a long and, in parts, steep descent to Sarria begins. The pilgrim enters the Medorra Mountains where they can enjoy the natural vegetation of fine oaks and birches. After the first big descent, the path turns 90 degrees to the left from which they will face a steep slope next to a spring that waters the route. The water is not treated (thus, drinking it is discouraged), but at least the pilgrims can cool their heads on hot days. A milestone indicates O Real, and from this point the descent becomes more pronounced. The ground of earth and stone gives way to a section on stone slabs. They look a little like artificial stairs, but caution should be increased to the maximum, especially on rainy days. Cows resting in adjacent fields probably count the slipping of pilgrims. The route continues downwards and caresses the small village Montán and crosses the neighbouring Fontearcuda a little before returning to the asphalt. At this point walkers will see a sign for Alquimista. After a few meters on asphalt a yellow arrow returns to divert the pilgrim. This time to the left, down a steep path on irregular ground for about 200 meters. Once at the bottom the shelter of the forest ends and the journey continues on a slightly more difficult dirt track, accompanied by a stream on its right margin. On the approach to A Furela the trail converts into a road where walkers have to turn left. 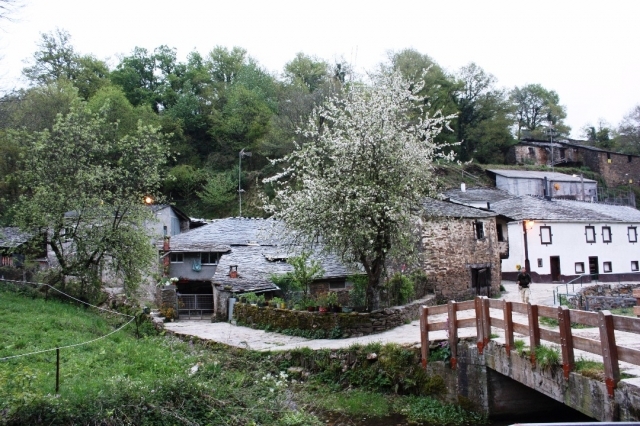 Before arriving at this small village the pilgrims pass Casa do Franco, a good place in which to rest the legs before continuing towards Sarria. 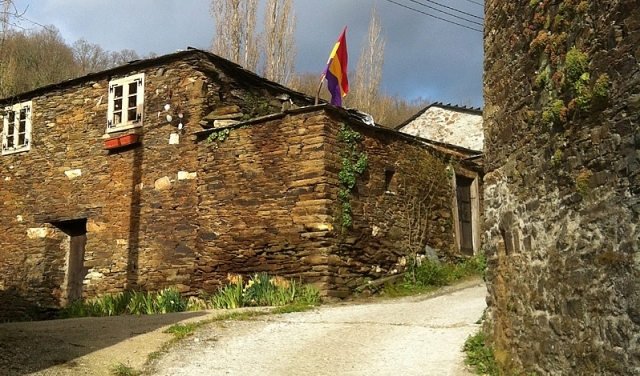 The Camino de Santiago enters A Furela, a hamlet where there are absolutely no services for pilgrims except for a sign with the phone number of a taxi driver (Conchi 646 018 164). This centre is also the border between the municipalities of Samos and Sarria. An emblazoned house stands out among the rest of the houses. The Camino goes around the village leaving on its right the chapel of San Roque to later meet again with the road, upon reaching a junction, a path deviates from the county to Pintín, one of the few places where it is possible to acquire food. In the village of Pintín they will find Casa Cines, which offers food and accommodation to pilgrims and has a vending machine at the entrance. On leaving this town, a comfortable road with little traffic is taken, although the road soon leaves the asphalt to a very steep, wooded slope, on uneven terrain. The Camino of Santiago now approaches Calvor. Without entering, it passes in front of the public Hostel that bears the same name and is located at the foot of a roundabout. In Calvor there is the Church of San Esteban, built in the VIII century on a fortified hill (an old fortified settlement of pre-Roman origin). With the passage of time and fashion, the temple has adopted a number of styles. Originally under the control of a monastery, although of this there are no traces other than its two gothic capitals. Pilgrims should follow the road signs for cars and continue straight ahead to Sarria. 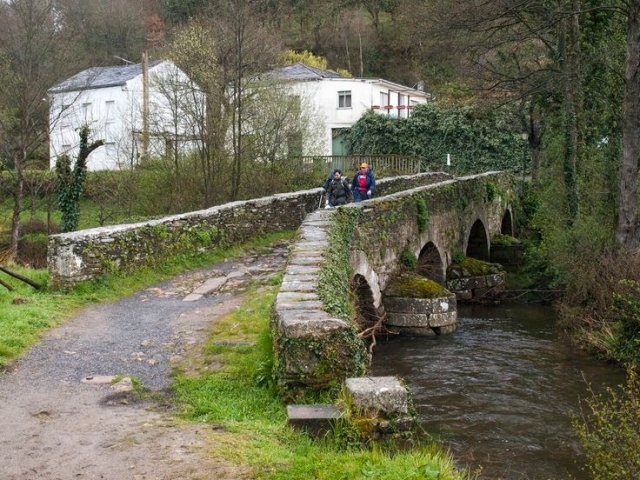 From here, and although many kilometres still remain to Sarria, the route runs parallel to the road, leaving only to go through the village of Aguiada, the point where pilgrims coming from Samos are united. In Aguiada there is a small but pretty chapel. In A Taberna do Peregrino, renovated this spring, it is possible to regain strength. On leaving Aguiada the pilgrim returns to the path parallel to the road until they reach the Hostel Paloma and Leña (3 km to Sarria), which benefits from a large green area. A sign at the entrance informs the pilgrims that those wishing to stop will be invited to tea. The final stretch to Sarria is only slightly leg breaking, but compared to the beginning of the stage it feels a bit like a military march. Vigo de Sarria, a village that was taken over by its bigger capital during the construction boom and now has become a kind of neighbourhood prior to Sarrria. The route until A Balsa is on a comfortable asphalt road. The climb to San Xil is complicated, especially in the rain. Those who do not like to step foot on earthy paths should continue to San Xil on the local road without entering A Balsa. From San Xil, the ascent to the Alto de Riocabo is on good ground but demanding. At this point it is possible to continue on the asphalt or follow the same path that pilgrims walk, although the second option is only recommended for experienced cyclists, because it has some very technical descent. When the signs for Alquimista begin to appear (the section between Fontearcuda and A Furela), there are a few short but steep descents that can be avoided by following the local road. The entry into Sarria is somewhat problematic because the signs are not as clear as they should be.